During one of the fabulous bead swaps hosted by my equally fabulous friend Lori Anderson, I was paired with Cindy Wimmer Muse. 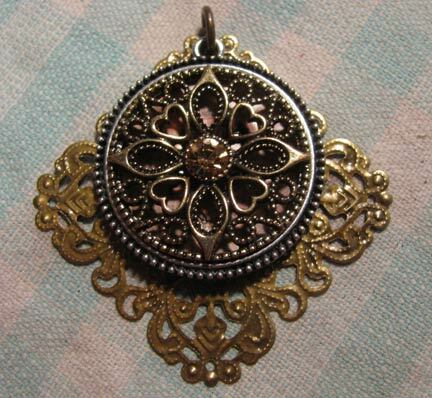 Besides a bunch of seed beads in wonderful metallic colors that I love so very very much, Cindy included this round cool filigree pendant just for fun. 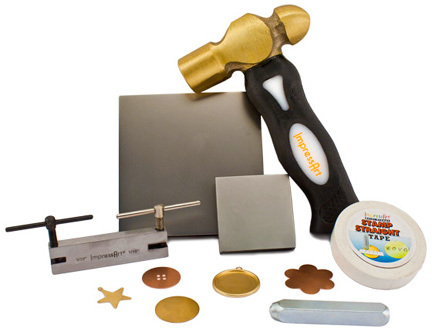 It took me awhile to figure out what to do with it, but when I received the package of tools from ImpressArt, it all came together. 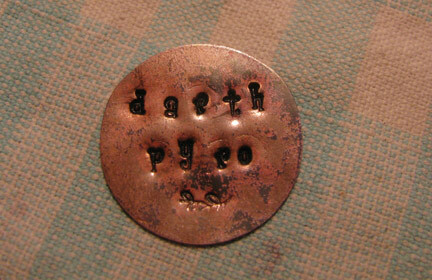 There were a couple of round copper blanks that were the perfect size to hide underneath the pendant to make a cool three layered pendant...with a secret message. My family all have adopted "Darth" names for each other (from Star Wars), and my nickname is Darth Pyro. Although I wouldn't exactly want to proclaim that to the whole world, it charmed me to think that I could wear it in secret and only reveal it to whomever I wanted. 1. 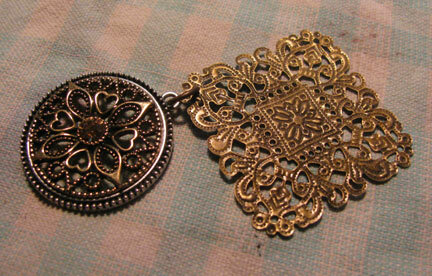 Use a jump ring to attach two filigree pieces together. 2. 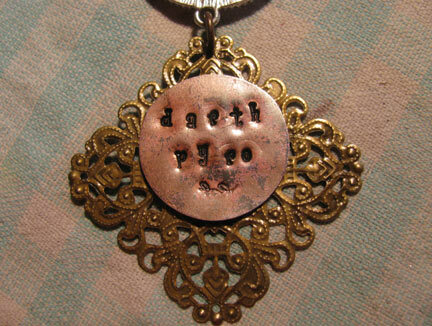 Using a copper or brass blank that is the same size (more or less) as the top filigree piece, stamp with your secret message. I added a heat patina to my blank first with a torch. I used black acrylic paint to make the words stand out. Black marker, which is usually recommended for this, will not wipe off a heat treated blank as easily as off of an untreated one. 3. Two-part epoxy makes an easy join, or you could add a hole to the blank and attach it to the jump ring. 4. I like the copper color just peeking through the top filigree piece.